Monty Alexander is one of the most undeservedly under-known musicians in jazz  a music admittedly filled with incredible talent unrecognized by the larger society they live in. Hailing from Jamaica  the island, not the section of the borough of Queens  pianist Alexander has long turned in performances rivaling Oscar Peterson's in their ability to meld melody, harmony and rhythm into a seamless whole. Perhaps it is his Caribbean roots that provide Alexander his rhythmic prowess, an ability to both lay down a melody and provide a solid sense of swing that is beyond even Peterson's magnificent abilities. His career has been focused mostly on the post-bop straight-ahead world of jazz  not so far from Peterson's own austere neighborhood. If Montgomery has always swung a little harder than his contemporaries, it hasn't done much in the way of establishing his reputation outside of jazz circles. 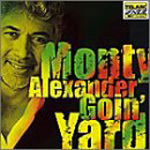 Of late, though, Alexander is on a Jamaican kick  following on the heels of an album devoted to songs by Bob Marley and a collaboration with reggae super-producers Sly and Robbie, Alexander's most recent release, "Goin' Yard," finds him recording live with a septet all drawn from his home island. While most of the songs are original compositions from his own pen, there are two Marley covers here ("Could You Be Loved" and "Exodus"), and a classic Jamaican folk song ("Day-O"), plus a cover of another classic reggae tune, "King Tubby Meets the Rockers Uptown." But don't go thinking Alexander has gone reggae on us. While there is a definitive Caribbean groove throughout this disc, it's still jazz all the way. It's just that it's jazz with a strong dance beat and Alexander's impeccable keyboard work combining to create a sound equal parts Caribbean and stateside. As always, Alexander's playing is top-rank, as evocative as it is swinging. No matter the setting, he remains one of our best pianists, and if anything steps it up a notch playing with his fellow countrymen.